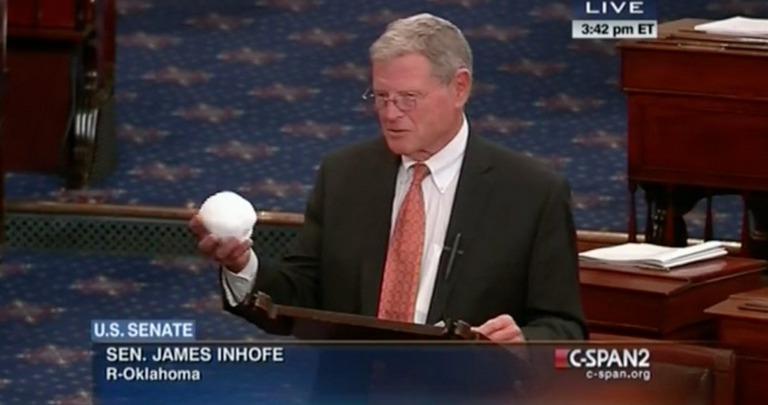 On Thursday, Senator Jim Inhofe (R-OK), who chairs the Environment and Public Works Committee, decided to spend some time (and whatever percentage of tax payer dollars funds his $174,000 salary) trying to disprove global warming by throwing a snowball to President Obama. As the President was not available to catch Jimmy’s snowball (presumably off somewhere making life difficult for hardworking Americans like you and me), a Congressional page had to act as a stand-in. Once again, Senator Jim Inhofe is an adult, is 80-years-old, is the head of the Senate’s Environment committee and should, really, know better. Devon Energy ($24,150) – One of the largest independent natural gas and oil producers in America (based in Oklahoma). Boeing Co ($22,600) – An American multinational corporation that designs, manufactures and sells airplanes, rockets and satellites (all of which run on fuel, natch). Murray Energy ($20,500) – The largest independent coal producer in the United States, whose CEO, Robert Murray, believes the globe is cooling. By far, the biggest contributions to Sen. Inhofe’s campaign committee has been the oil & gas industry, which donated $454,500. It’s possible that the right honorable senator from Oklahoma really does believe God would not allow humans to warm the globe. Whether or not God is cool with Jim lining his pockets every time he says so – that’s beyond my earthly ken. Read the rest on Planet Experts.